In his acceptance presentation at the Dyalog '11 user conference, Joel Hough, the grand prize recipient of the 2011 World Wide APL Programming contest, shared that when he explores a new programming language, he first looks for a website which introduces the language. Many languages have "Try" websites – Haskell has TryHaskell.org, Ruby has TryRuby.org, and so on. Joel then expressed his disappointment that there was no TryAPL site to be found. Joel need be disappointed no longer. 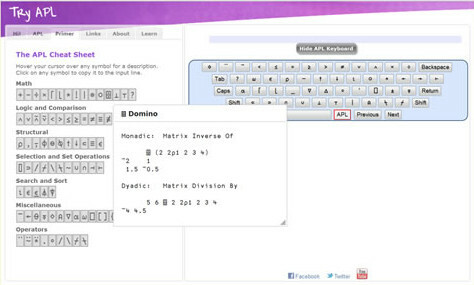 An interactive APL "session" in which functions and variables can be defined and used. Code examples on which the user can click to copy into the session input and then modify or execute. Previous inputs can be recalled to be modified or re-executed. "Boxed" display which allows the user to more clearly see the structure of an array of depth greater than 1. A page with links to a variety of APL related resources. A growing library of interactive tutorials. Output which is excessively wide or long is truncated and annotated as such. A Primer page which implements an APL "Cheat Sheet" with symbols which a user can hover over to display its usage or click on to copy it into the session input field. Their own keyboard after downloading the Dyalog IME (Input Method Editor). TryAPL has a few limitations. Operations which could be potentially harmful, the execute function for instance, are not permitted. The CPU time a user-entered statement may consume is limited as is workspace size. User statements are executed in separate, restart-able, APL processes to prevent any error in execution from affecting the TryAPL server. TryAPL is written in APL and implemented using MiServer, Dyalog's open-source APL-based web server running on Linux. MiServer itself runs under either Windows or Linux. Much of the client-side interaction of TryAPL makes use of jQuery and jQueryUI. To use TryAPL, open the web browser of your choice and navigate to the TryAPL.org website. For more information about TryAPL or MiServer, please contact tools@dyalog.com.